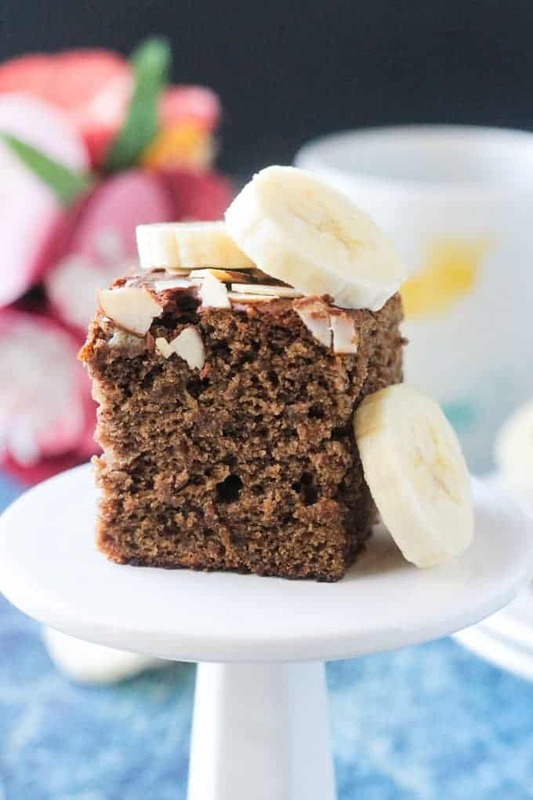 Gluten Free Banana Bread Cake – a delicious, fluffy, and easy way to use up those overripe bananas. Bonus: it’s gluten free and grain free thanks to banana flour! 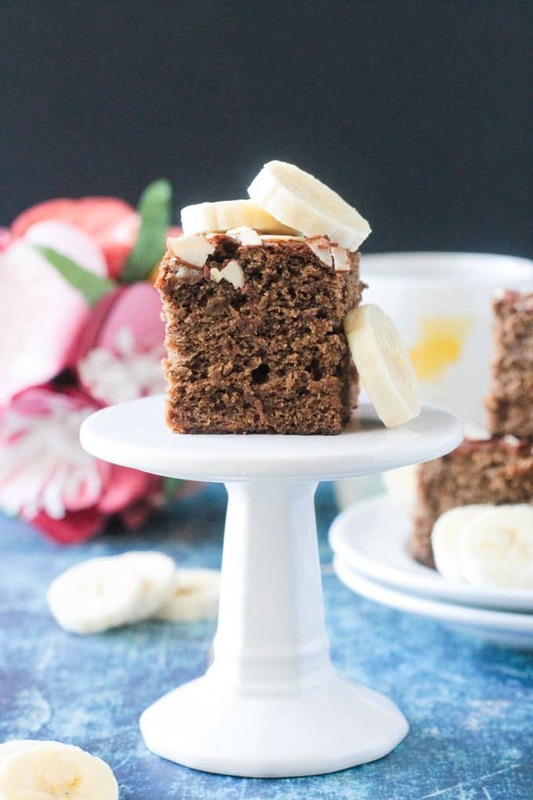 This Gluten Free Banana Bread Cake bakes up light, fluffy, and moist! 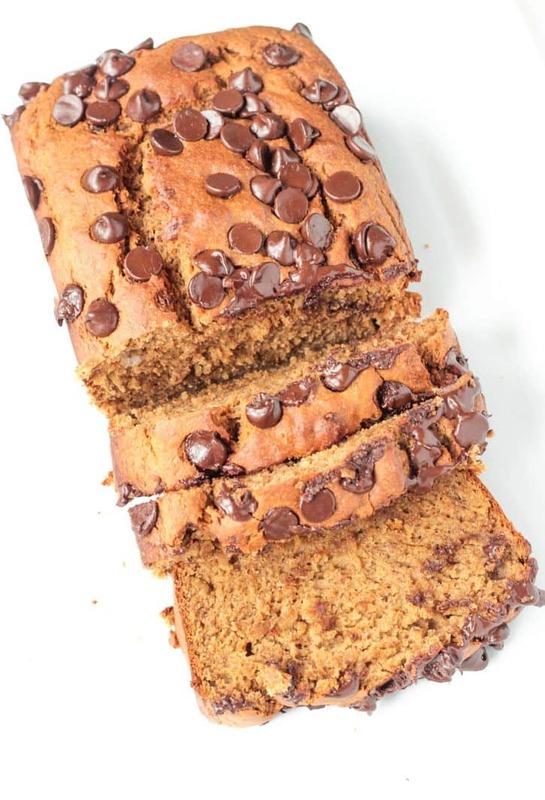 It’s loaded with banana flavor and my kids went crazy for this on their last day of school….each of them asking for seconds! This cake is a great way to use up any leftover bananas you have lying around the house. Don’t throw away those brown spotty ones! They are super sweet and perfect for baking! (or for making dairy free ice cream!). 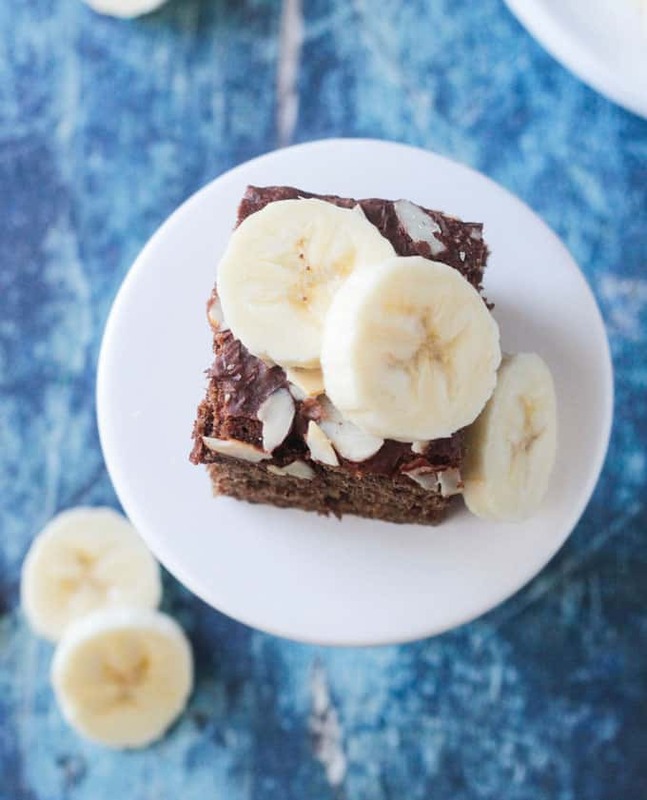 This Banana Bread Cake is healthy enough for breakfast, but sweet enough for dessert. It makes a great afternoon snack too! 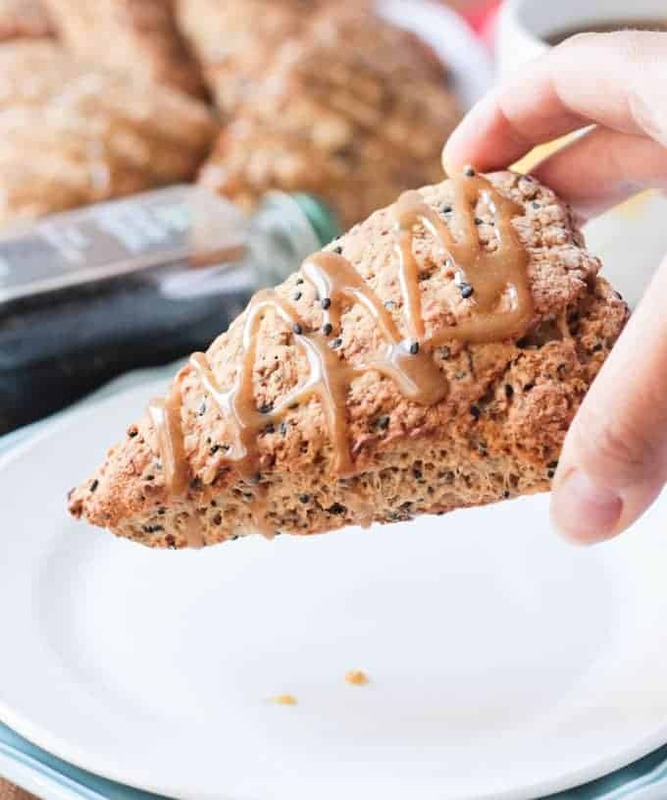 Oil free, egg free, gluten free and refined sugar free – you can feel good about reaching for another bite. I found a bag of banana flour at my local Home Goods store recently. I was intrigued and decided to give it a try. Banana flour is made from green bananas. It’s not sweet, but actually slightly nutty, and doesn’t taste of bananas at all, making it a great substitute for wheat flours. It’s gluten free, grain free, and full of nutrients. It’s not quite a 1:1 sub for wheat flours, though. You need a bit less banana flour than wheat flour. I quickly whipped up this almond butter frosting as a last minute addition. 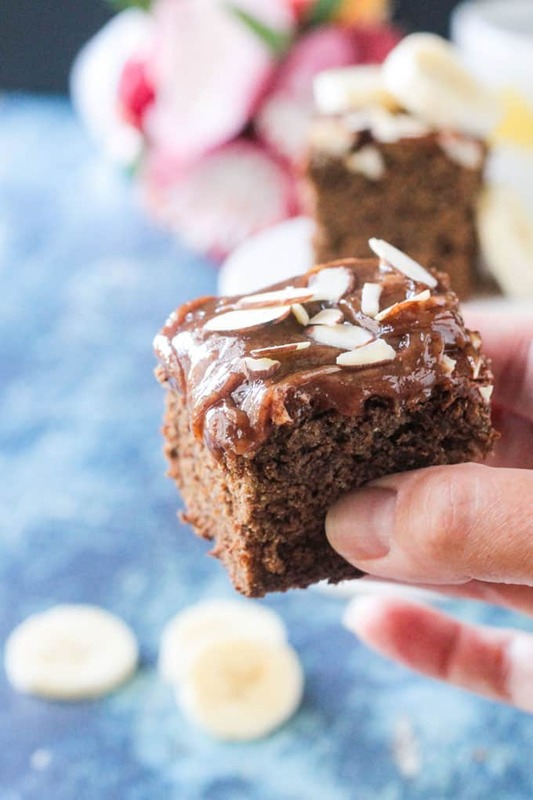 It’s entirely optional – the banana bread cake is perfect as is – but the frosting will take the decadence level up a notch. 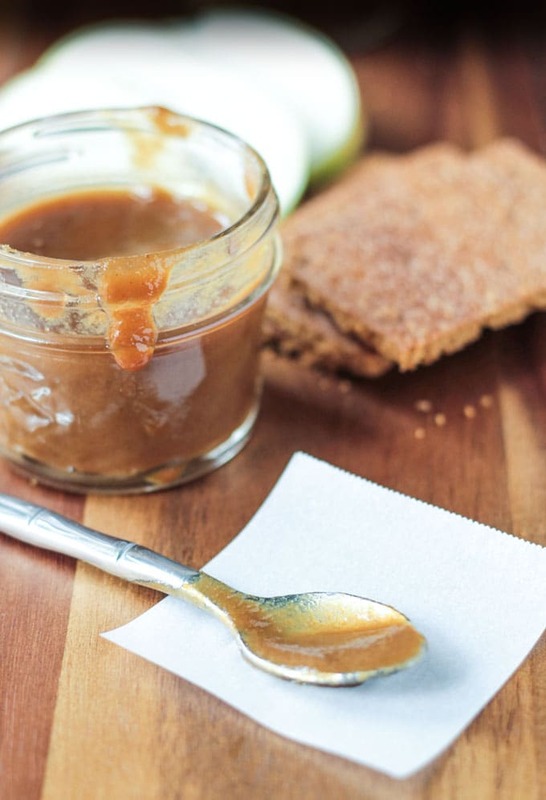 The frosting is not refined sugar free – although you could use a tbsp or 2 of pure maple syrup instead of the powdered sugar if you wish. I hope you love this Banana Bread Cake as much as we do! If you try it, please leave me a comment below with your feedback and star rating. You can also find me on social media. Be sure to tag @veggie_inspired and #veggieinspired so I’m sure to see it. Enjoy! 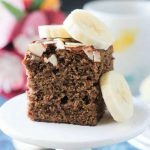 Gluten Free Banana Bread Cake - a delicious, fluffy, and easy way to use up those overripe bananas. Bonus: it's gluten free thanks to banana flour! Line an 8x8 baking pan with parchment paper, letting the ends overhang so you can use them as handles later. Or, if you don't want to use parchment, lightly spray the baking pan with cooking spray. In a large mixing bowl, stir together the almond butter, coconut sugar, aquafaba, vanilla, and smashed bananas. Gently stir the dry ingredients into the wet ingredients until just combined. Sprinkle the slivered almonds, if using, all over the top of the batter. Bake for 40-45 minutes until a toothpick inserted in the center comes out clean. Let cool in the pan on a wire rack for 10 minutes. Using the parchment "handles" lift out the banana bread cake and continue to let it cool on the wire rack. If you are using the Optional Almond Butter Frosting: Add all ingredients to a small bowl and stir until well combined. Add a touch more liquid if you want it thinner or add a touch more sugar if you want it thicker. *Nutrition facts calculated without the optional Almond Butter Frosting. I need to find this banana flour you speak of. This bread looks delicious!! Thanks, Stephanie! I found it at World Market – love that place for interesting food finds! But, I’m sure it’s available elsewhere too. This looks so amazing, and I’ve never heard of banana flour before. I want to make this recipe and sub in banana milk in the frosting, just to maximize the banana usage! Oh, banana milk sounds amazing! Let me know how it turns out! Beautiful! Indeed it looks light and fluffy!! The almond butter frosting must taste dynamite with the almond butter – such a great pairing. I’ve never heard of banana flour but it sounds so good! 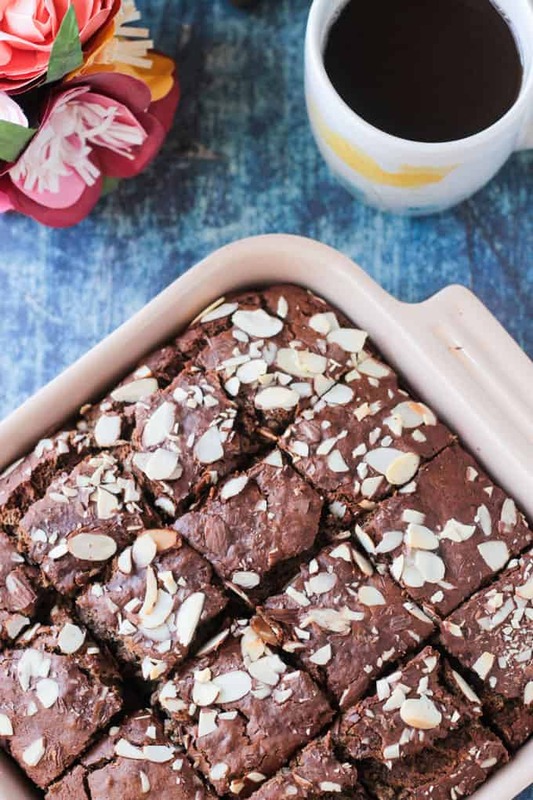 This banana bread would be polished off very quickly in my house:) Thank you for sharing. It definitely didn’t last long here! Thanks, Tania. Hope you love it! 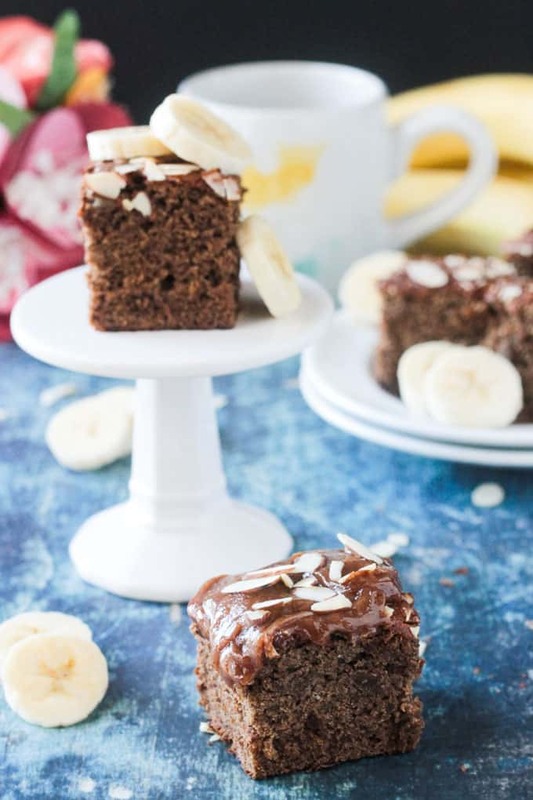 What a genius idea to turn banana bread into cake! And that icing, OMG. I can’t wait to try this! I was licking the frosting straight from the bowl! It’s good on toast too! 🙂 Thanks, Brittany! O-m-g I’ve never heard of banana flour. This is amazing!!! Would love to make this recipe!!! Can his be made without aquafaba – if so what should be used in place of it? Oh wow, it’s so cool that you only used banana flour. I love that you didn’t have to mix it with another gf flour. Banana cake is one of my favorites and I can’t wait to try this, Jenn. Banana flour was a great find! Let me know if you try it! Thanks, Linda!